This lecture series on arbitration commemorates the life and work of John E.C. Brierley, who was Professor and Dean of Law at McGill. 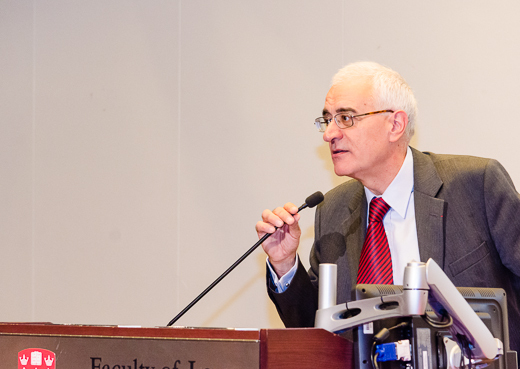 Brierley was a prominent figure in the discipline of comparative law internationally and the leading Canadian expert on arbitration. 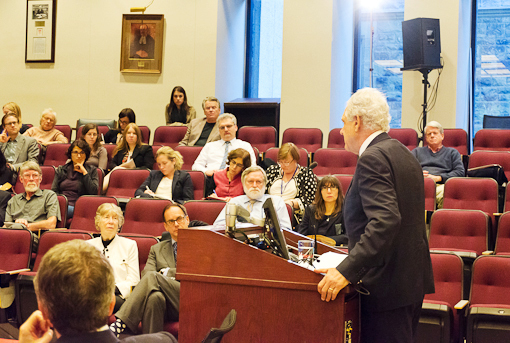 The annual lecture is presented by McGill Law and its Research Team on Private Justice and the Rule of Law, with the participation of the Canadian Bar Association (Québec branch). The lecture is made possible by the John E. C. Brierley Memorial Lecture Fund established by L. Yves Fortier and the sponsorship of Woods LLP. Lucy Reed, International Dispute Resolution Courts: Retreat or Advance? The Private Justice and the Rule of Law research team, with the support of the John E.C. 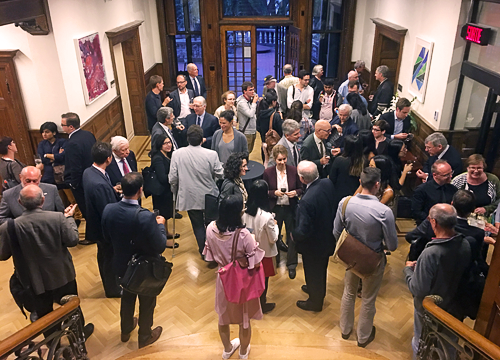 Brierley Memorial Lecture Fund established by Yves Fortier, and the L. Yves Fortier Chair welcomed Professor Lucy Reed, Director of the Centre for International Law at the National University of Singapore. In her conference, Professor Reed examined the growing role of some international judicial institutions of dispute settlement and describe their evolution. The event was followed by a reception in the Foyer of Old Chancellor Day Hall, generously offered by Woods LLP. 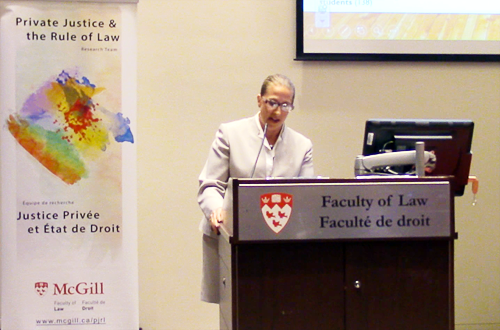 Professor Susan D. Franck, of the Washington College of Law, delivered the 2016 Brierley Memorial Lecture at McGill University. 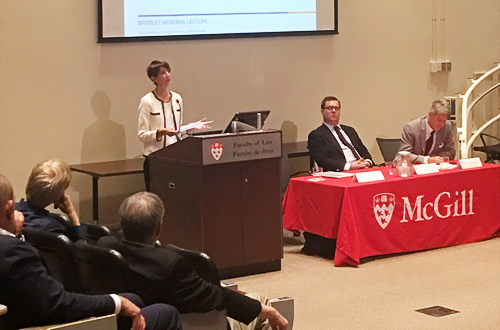 The lecture exposed the common but flawed accounts of international arbitration based on anecdotes and myths, and challenged the audience to face reality by paying more attention to facts. Emphasizing the importance of empirical research and evidence-based policy, she chastised all of those responsible for the “post-truth” accounts of investment arbitration that have dominated the media. Professor Franck also discussed some of the cognitive decisional impairment factors that can affect outcomes and valuations in international arbitration. The event was followed by a cocktail reception generously sponsored by Woods LLP. Dominique Hascher, Les perspectives françaises sur le contrôle de la sentence internationale ou étrangère. 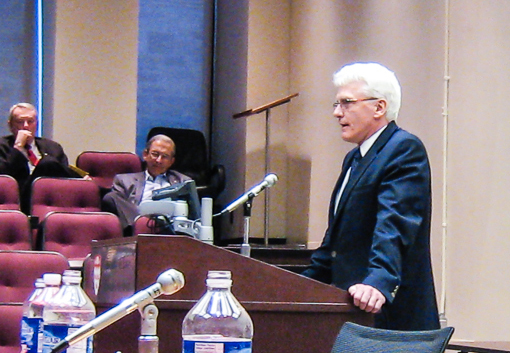 In December 2013, attorney and noted arbitrator Gary Born, International Arbitration Practice, WilmerHale LLP in London, delivered a talk titled "The Law Applicable to International Arbitration: Agreements Past, Present and Future". 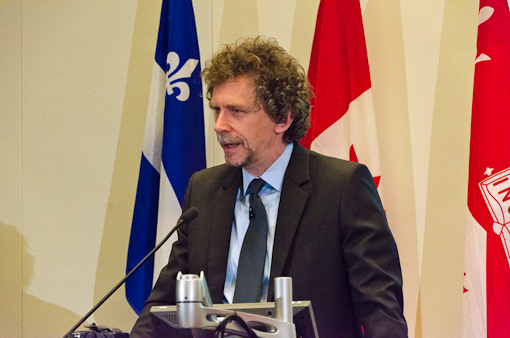 You can listen to his presentation as a Webcast, an MP3, a WMV, or an MP4, or read the summary. George Bermann, Jean Monnet Professor of EU Law and Walter Gellhorn Professor of Law at Columbia Law School, gave the 2012 Brierley Memorial Lecture, titled “The ‘Arbitrability’ Trap.” Read more about his lecture in Law Focus online, October 2012. You can also listen to his lecture as a Webcast, an MP3, a WMV, or an MP4. Emmanuel Gaillard, Professor - Université de Paris XII; Chairman - International Arbitration Institute (IAI); Head of the international arbitration practice - Shearman & Sterling, L’ordre juridique arbitral: réalité, spécificité et utilité [.pdf]. Jan Paulsson, President - London Court of Arbitration (LCIA) & President - World Bank Administrative Tribunal, spoke about how International Arbitration is Not Arbitration [.pdf]. Andreas F. Lowenfeld, Public Policy and Private Arbitrators: Who Elected Us and What Are We Supposed to Do? 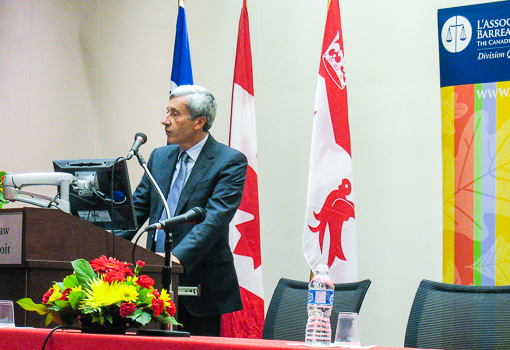 Renowned arbitrator and Chairman Emeritus of Ogilvy Renault, L. Yves Fortier gave the inaugural Brierley Memorial Lecture. His presentation was titled Caveat Investor! Investor Protection Under Investment Treaties [.pdf].